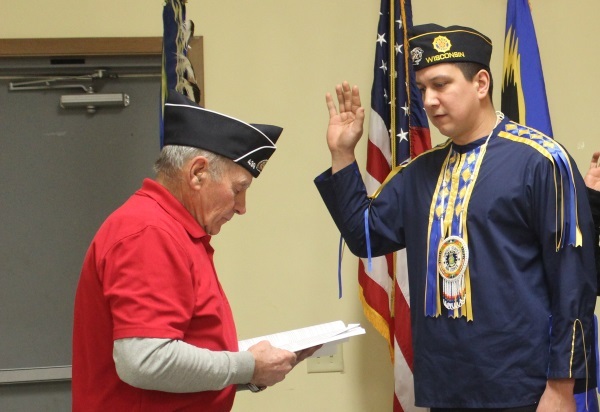 On Wednesday, March 13, Blackdeer was sworn-in by County Commander David Hale at the Jackson County American Legion monthly meeting. Post 129 hosted the meeting. Blackdeer is the son of Betty and the late Randall Blackdeer. He and his wife, Rosa, have a son, Randall III, and a daughter, Isabel. Previous Commander Jessika Greendeer asked Blackdeer if he would take over the duties as commander and his nomination to the position was approved at the January meeting. Blackdeer served in the U.S. Air Force from 2002 to 2010. He was stationed at Lackland Air Force Base in San Antonio, Texas, and then at Wright-Patterson Air Force Base in Dayton, Ohio. Blackdeer was deployed to Iraq once for four months, and twice for six months each. By profession, Blackdeer is a Ho-Chunk language instructor, teaching high school freshmen and also instructs online community classes. He was an apprentice for three years and has advanced to an instructor, developing materials and refining teaching skills. In his duties as American Legion commander, he will preside over meetings and will be the main point of contact, getting people together for various appearances and functions. His duties are to create and oversee a budget and to organize the annual Memorial Day Powwow in Black River Falls. In addition, he manages the upkeep of the Post 129 building and is the contact for renting it out for various events and functions. He knows that he’s one of the younger veterans, issuing in another generation of legionnaires. The job ahead is to recruit the younger people, which is a lot of work, he said. He plans to conduct a recruiting drive to gain more members. However, a recent report shows that the county American Legion is successful, having met its goal of 80 percent membership of veterans in the county. “We’re sitting in a good spot,” Blackdeer said. “I’m proud to keep the traditions of Legion going,” Blackdeer said. His father was a veteran and a member of the American Legion. His grandfather was a veteran in World War II and was a Code Talker.